Roger Stone, a longtime Republican political operative in Washington and ally of President Trump, was arrested by the FBI in Fort Lauderdale, Florida shortly after 6:00am ET this morning, CNN reports. Stone has been indicted by Robert Mueller’s special counsel which is investigating Russia’s interference in the 2016 presidential election. 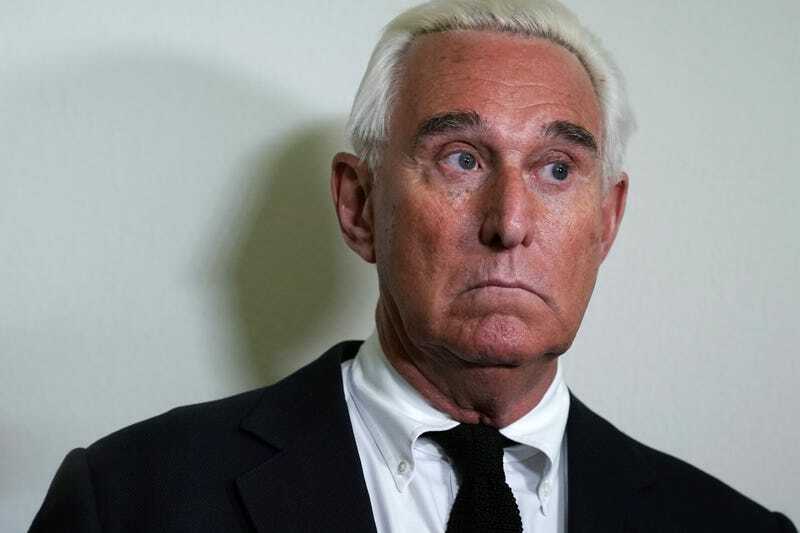 Stone is being charged with seven counts, including one count of obstruction, one count of witness tampering, and five counts of making false statements. The indictment, which was unsealed by the U.S. Justice Department early this morning, doesn’t contain the name WikiLeaks, but an “Organization 1” in the documents fits the group’s description. Stone is alleged to have been in contact with WikiLeaks during the 2016 campaign while the organization, founded by Julian Assange, obtained emails hacked from the Democratic National Committee and former Hillary Clinton campaign aide John Podesta. Assange has been hiding in the Ecuadorian embassy in London since June of 2012, when he skipped bail on sexual assault charges made in Sweden. Those charges were later dropped, but Assange remains in the embassy. In the most startling allegation, the indictment claims Stone was in contact with a “high-ranking Trump Campaign official” who sent a text message to Stone that read “well done” after the first batch of stolen emails was released by WikiLeaks on October 7, 2016. On or about October 4, 2016, the head of Organization 1 held a press conference but did not release any new materials pertaining to the Clinton Campaign. Shortly afterwards, STONE received an email from the high-ranking Trump Campaign official asking about the status of future releases by Organization 1. Mueller’s indictment also states that the Trump campaign continued to prod Stone for more information about the release of Clinton emails and Stone replied that they should move to the messaging platform Whatsapp. Whatsapp, owned by Facebook, is believed to be a secure messaging service because of its end-to-end encryption. Later that day, on or about October 4, 2016, the supporter involved with the Trump Campaign asked STONE via text message if he had “hear[d] anymore from London.” STONE replied, “Yes - want to talk on a secure line - got Whatsapp?” STONE subsequently told the supporter that more material would be released and that it would be damaging to the Clinton Campaign. But allegedly lying about it seems to be the crime that Mueller is really going after Stone for most aggressively. Stone testified to the House Permanent Select Committee on Intelligence on September 26, 2017 that he had no advance knowledge about the release of the hacked emails, but Mueller’s indictment says otherwise. “These hearings are largely based on a yet unproven allegation that the Russian state is responsible for the hacking of the DNC and [the Clinton Campaign chairman] and the transfer of that information to [Organization 1],” Stone told the committee in September of 2017. In truth and in fact, STONE had sent and received numerous emails and text messages during the 2016 campaign in which he discussed Organization 1, its head, and its possession of hacked emails. The special counsel does not allege that Stone coordinated with the Russian government to hack the DNC emails, only that he knew about it, coordinated with the Trump campaign by telling them when the emails would be released, and then lying to investigators and Congress about the entire situation. And this indictment again touches people at the very top of President Trump’s campaign. The indictment also alleges that Stone told “Person 2" to lie to investigators. “‘Stonewall it. Plead the fifth. Anything to save the plan’ . . . Richard Nixon,” Stone allegedly texted the unnamed Person 2. Stone’s career in Republican politics dates back decades and he even has a tattoo of Richard Nixon on his back. And in yet another mob-like tactic during an investigation filled with mob-like tactics, Stone allegedly invoked the movie The Godfather Part II. President Trump, an unindicted co-conspirator who has been investigated by the FBI for being a Russian asset, denies the allegations that he’s had anything to do with Russia, despite the fact that he was pursuing a real estate deal in Russia to build a Trump Tower in Moscow as late as November 2016, according to his lawyer. Stone is scheduled to appear in federal court in Florida around 11:00am ET today, CNN reports. Update, 8:55am ET: White House press secretary Sarah Sanders just appeared on CNN and was asked about Roger Stone’s arrest. “This has nothing to do with the president and surely nothing to do with the White House,” Sanders said, despite that not being true at all. Sanders was asked about the indictment and why it specifically mentions the Trump campaign. “I’m not an attorney, I haven’t read through that. What I can tell you is that the specific charges brought against Mr. Stone have nothing to do with the president, nothing to do with the White House,” Sanders continued. Update, 11:25am: President Trump, who was atypically quiet this morning on Twitter, just shared his thoughts about Stone’s arrest. He apparently believes the real scandal in all of this is that CNN got footage of the arrest. And according to people on the ground, Roger Stone was just released on $250,000 bond. Update, 12:50pm: Roger Stone just held an impromptu press conference and says he plans to plead not guilty. You can watch his statements here. Correction: This article originally stated that the FBI had captured footage of Stone’s arrest which was aired by CNN. It was captured by freelance photojournalist Gil DeLaRosa for CNN. Gizmodo regrets the error.